Question: Is there an electronic part that exploits the molecular structure of P and N type silicon and allows AC and DC to flow in only one direction? 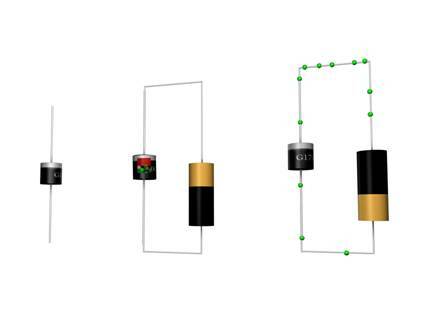 The diode can be thought of as a one-way gate, for electrons. It allows electron current to flow in one direction and not the other (Zener diodes are an exception to this). 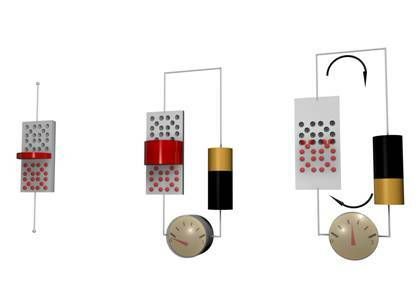 3D model of the diode on the left. The schematic symbol for a diode on the right. Diodes are often used in voltage conditioning and helping to change AC voltages into DC voltages by removing one direction of current flow from an AC signal. This is called rectification of voltages. They can also be used to drop voltages down to lower voltage levels and they can be used in motor applications where reverse voltage spikes can potentially damage sensitive parts of your circuit. 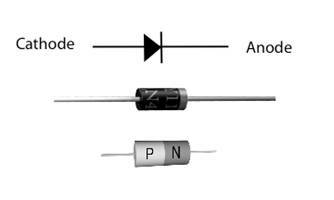 A diode is an electronic semiconductor that uses p-type and n-type silicon junctions. That is, the p-type silicon is near the n-type silicon inside a cylindrical package below. While a diode can act as a one-way valve for electricity, it only conducts if the voltage comes up to about .6 volts. A diode also lowers the voltage slightly. The actual voltage drop changes according to the type of diode. In this case, we will be using a silicon diode so we can expect the .7v drop. However, Schottky diodes drop the voltage by 0.3v and Germanium diodes by only 0.2 volts. When a semiconductor, such as a diode is created with p-dope and n-dope materials, there is a tendency for electrons to migrate from the n-zone to the p-zone. There is also a tendency for the holes to migrate from the p-zone to the n-zone. The effect is a cancellation of charges in the region between the two, and this is called the depletion layer. The effect of bias on the diode is that in one direction, it conducts and in the other, it does not. The effect of bias on the diode is that in one direction, it conducts and in the other, it does not. Here you can observe the model is showing you the voltage drop occurring across the diode. This depletion layer sets up a potential difference between the two regions and the device remains in a stable state until an external voltage is applied. You can generally identify diodes because their part numbers start with the prefix In1N with common parts being 1n4001, 1n4002, 1n4007, etc and you can identify them by the single white band near the cathode wire of the diode. In glass diodes, a black band is used to show the cathode. With diodes, be aware of IF, which is the forward current moving through the diode. VF is the forward voltage moving through the diode, and the PIV, or peak inverse voltage, is the voltage under which the diode will conduct in reverse bias. If the PIV is exceeded you can permanently damage your diode. These are the absolute maximum ratings for the diode and you must pay attention to these values when you are selecting your parts.